Here is a collection of photos from the conference taken by Dennis, Jean-Michel and Anna-Jean. Our 2007 annual meeting was held in Albuquerque, NM, on Jun 7th - 10th. 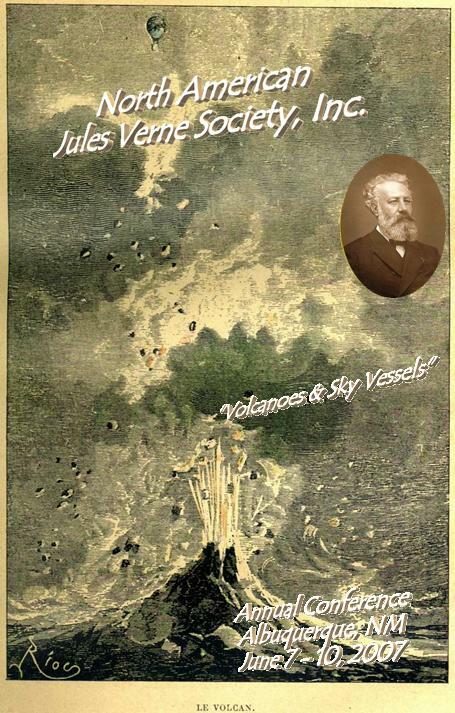 The theme of the meeting was “Volcanoes & Sky Vessels”. The Albuquerque Museum of Art and History. 9:00 AM Welcome back, Announcements, etc. - Rick Walter, Barbara Bryant, Andy Rogulich. - Andy Rogulich, NAJVS Inc. Here is a link to his Microsoft PowerPoint presentation. unique playlet: Nemo’s Giant Pearl. Prof. Stanford L. Luce, Vernian pioneer. Peter changed his topic to talk about bachelors in Verne with a particular focus on Wilhelm Storitz. - Dr. Alan Hale, co-discoverer of Comet Hale-Bopp. we hope that they will be able to join us sometime in the future.